One imagines David Diao’s not-quite retrospective at Postmasters, the gallery’s last in its Chelsea space, accompanied by a catalogue essay titled ‘Painting and the Task of Melancholy’. Academic types, of which Diao is one, will recognize that title as a play on art historian Yves-Alain Bois’s now canonic 1986 essay, where ‘mourning’ stands in place of ‘melancholy’ and in which painting’s ‘death’, of that of it as a coherent medium, has been assumed. Those same types will go racking their heads for Freud’s distinction between the two concepts—hint: in mourning, one works through the loss of something; in melancholy, one fails to work through this loss because one doesn’t know, is not conscious of, what it is that was really lost. In mourning we grieve, but we get over it, by working through the grief; in melancholy, we can’t work through it, so we circle it, over and over and over again. Diao has been active since the late sixties, when he gained recognition for the kind of rigorous procedural abstraction that Robert Ryman (a hero of Bois’s) had staked out earlier in the decade. But Barnett Newman is the artist’s hero, and here homage is paid by the recent Spine 1 (2013), a screen print of the cracked spine of a Newman catalogue that has been in the artist’s personal library for decades—it runs down the center of the painting’s large acrylic field just like one of Newman’s zips. Newman appears again in Twice Hammered (2011), where one finds the reproduction of Diao’s earlier Barnett Newman: The Paintings (1990; for which Diao presents all of Newman’s paintings at small scale and reduced to the shapes of their canvases) next to that work’s accompanying catalogue entry from a May 2005 Christie’s Hong Kong 20th Century Chinese and Asian Contemporary Art sale. The work was estimated at $40,000-60,000 (HKD) and ‘hammered’ down at $7000, at least that is what is penciled in on the page. ‘Ouch’, one thinks, but then remembers the exchange rate; and in 2005, $7000 USD would net one roughly $54,500 HKD, well within the estimate, and so, depending upon your perspective, either a tragedy or a steal. 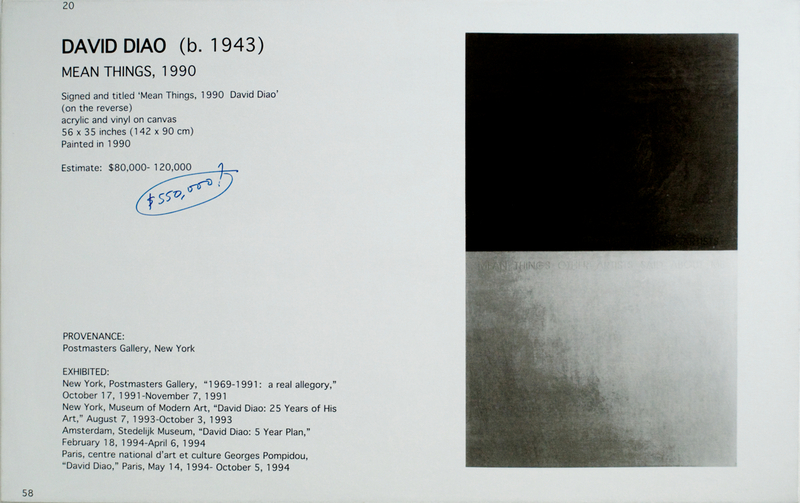 It is exactly this question of worth and value—not just what Diao’s paintings are worth on the market (see Sales, 1991, which catalogues the artist’s auction record), nor how they are valued by one of the art world’s reigning investment banks (see Double Rejection 1 (MoMA Boardroom), 2012, which reproduces a work that no longer hangs in the museum’s innermost sanctum), but also how the artist conceives of his own value in relationship to the history he himself values (see Salon 2, 2011, which juxtaposes a photograph of Diao reclining in a Barcelona chair at Philip Johnson’s Glass House with one of Philip Johnson himself, Andy Warhol, Robert A. M. Stern, and others in that same exact spot)—that is at the center of Diao’s practice as a painter. One would even say he circles it, over and over and over. Melancholics of this order are sometimes tough to bear. But after a time—forty years, say—their endurance can only be called heroic.